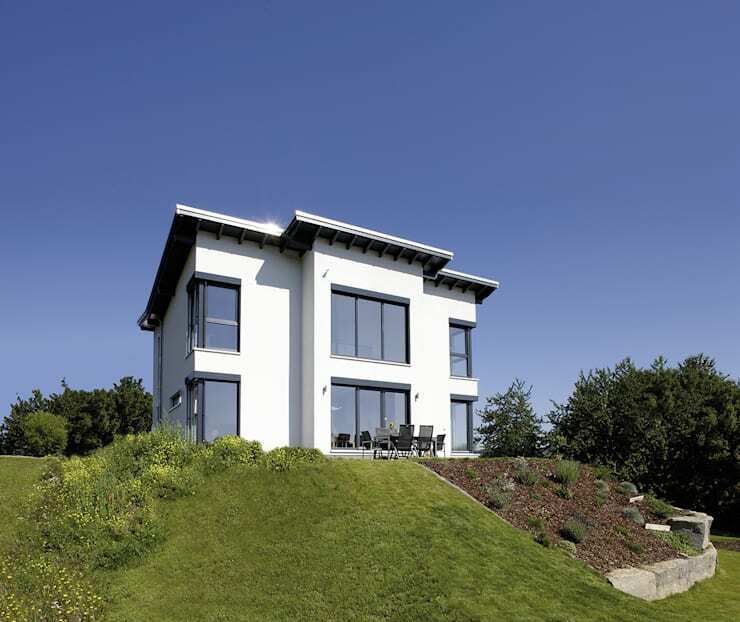 Constructed on a corner plot of land above a stone foundation, this house in Germany is extremely modern and functional. Its brilliant white exterior, large glass windows, advanced heating technology, and spacious interiors are inviting as well as stylish. 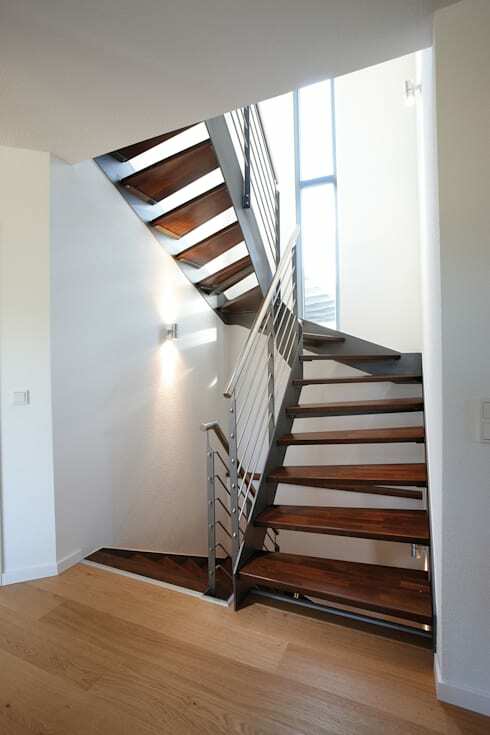 Rendered by the home builders at Fingerhaus GMBH, the residence boasts of trendy furnishing, warm wooden flooring, sleek designs and elegant integration with the outdoors. Take the tour to learn more. The stepped stone landscape with grass growing lusciously all over the gradient make for a picturesque setting for the house. 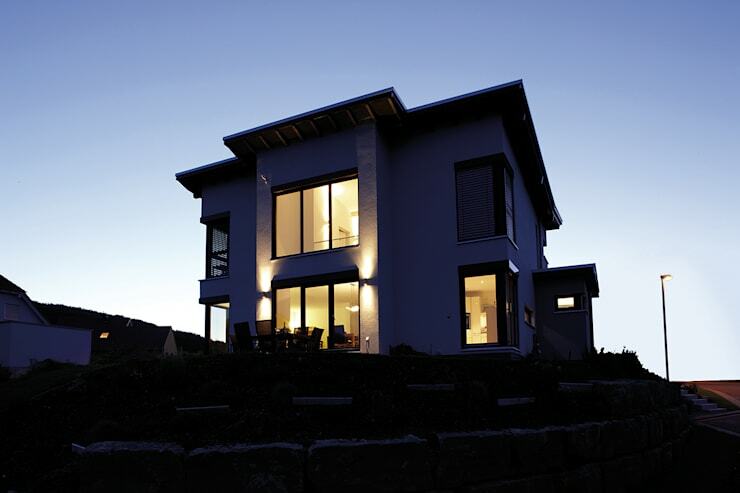 Rendered in white with numerous glass windows all around, the building looks smart and welcoming. 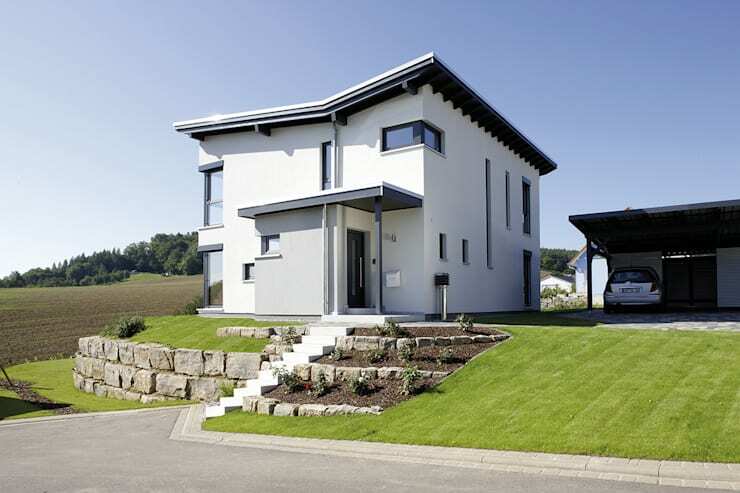 The small shaded porch and the garage on the right look modern as well. Shaded grey stone tiles on the floor lead you to the simple but elegant entrance. 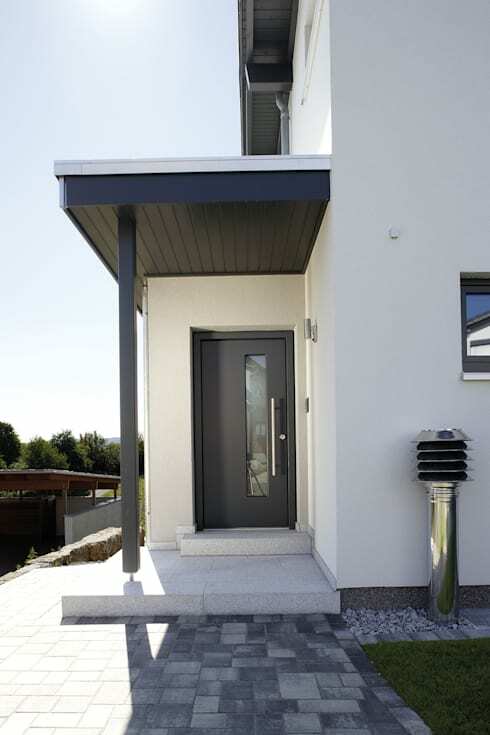 Done up in white and grey, this shaded spot protects you from the sun and rain while you wait for the door to open. 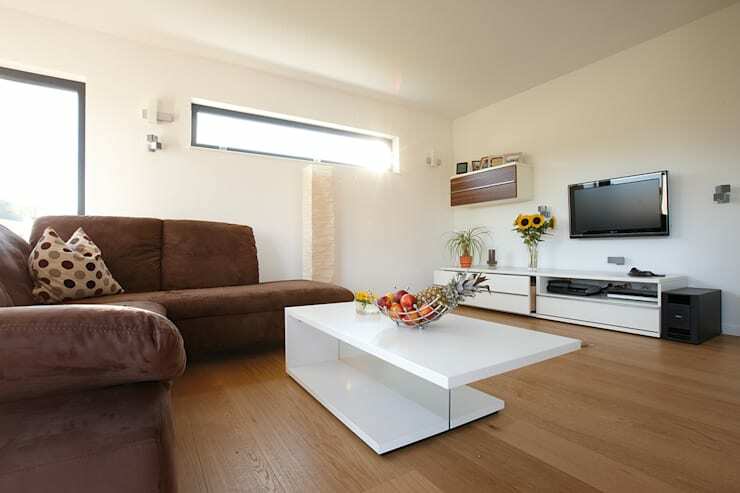 Warm tones of brown and spotless white come together in this trendy and comfy living space. A plush L-shaped sofa, a sleek coffee table and a stylish and practical TV unit comprise the furniture here. Fruits and flowers add colour. 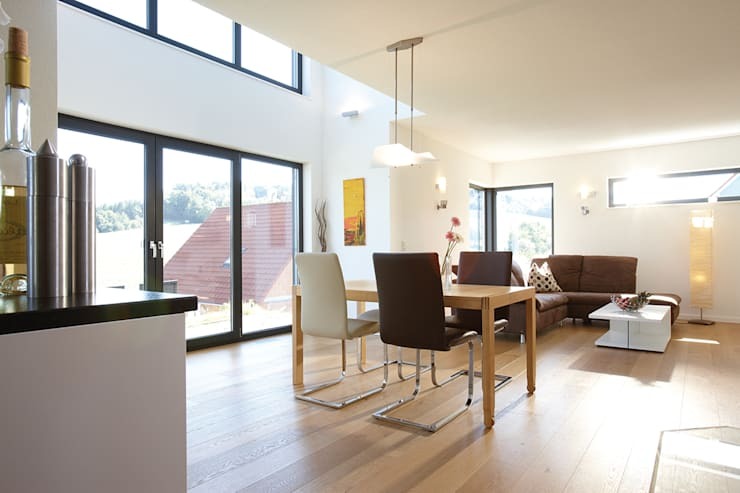 We love how the indoor dining merges with the living space seamlessly without any interior walls. Large glass doors on the left flood the dining with natural light. The space between the indoor and outdoor dining is double-height and features massive glass windows to bring in sunlight. 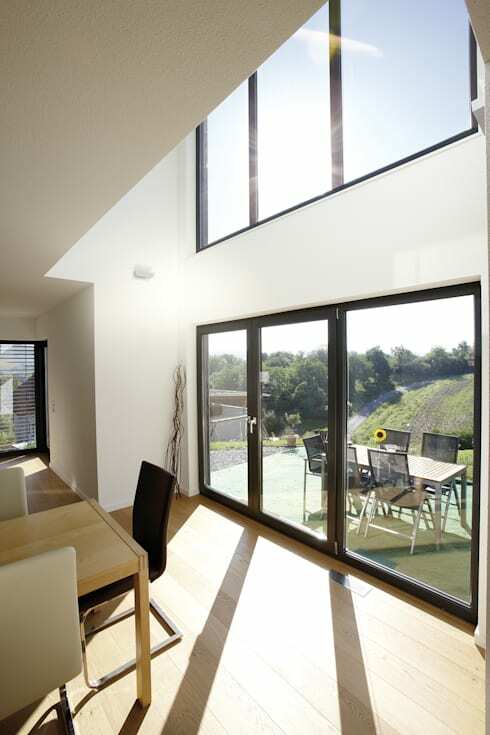 These windows also visually open up the interiors to the gorgeous backyard and ensure ample ventilation when left open. 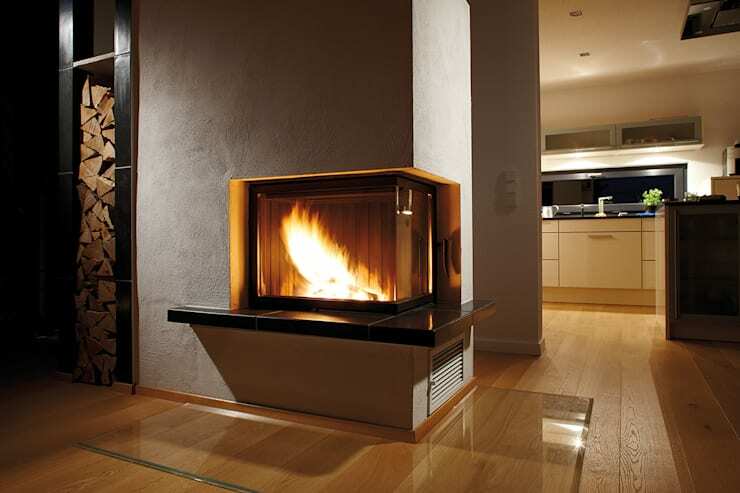 The modern fireplace has been built into the corner of this wall and comes with an L-shaped projection in wood for seating. A sleek and tall shelf on the left holds the wooden logs, and you catch a glimpse of the stylish kitchen from here. 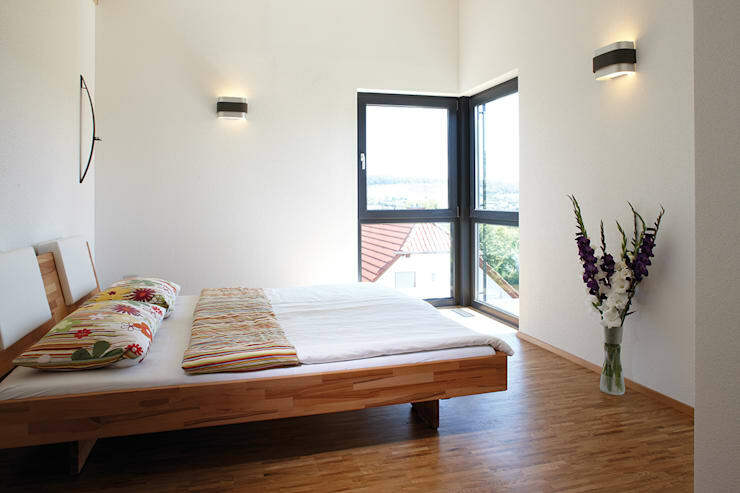 With a sleek and fashionable wooden bed as the only piece of furniture, the bedroom is delightfully minimal and contemporary. White walls and large glass windows ensure a bright atmosphere, while a vase holding orchids offer freshness. 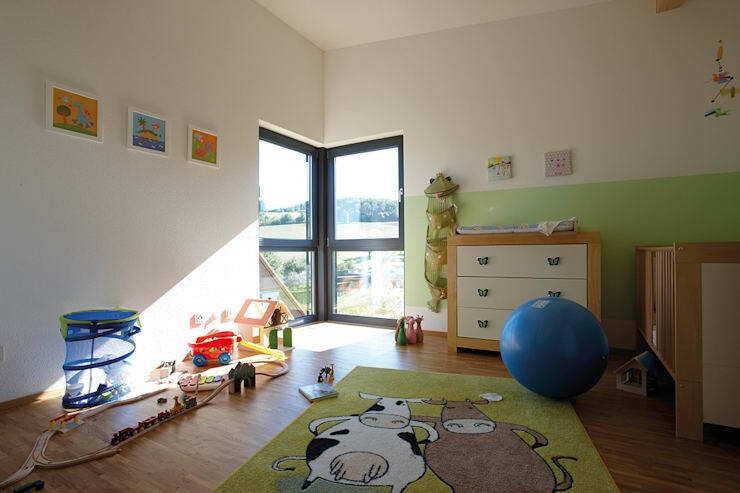 Colourful toys, lively framed artworks, sleek and simple furniture and a funny rug make the nursery cosy and joyful. Tall glass windows in the corner bring in loads of natural light. 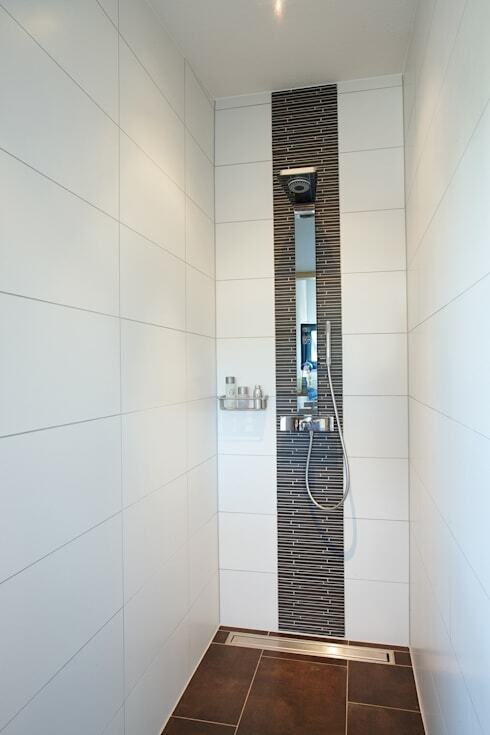 Large white and grey tiles make the bathroom look spacious and elegant. The luxurious tub in the corner looks ready for a hot soak, while a simple shelf stands by with wicker baskets to store essentials. 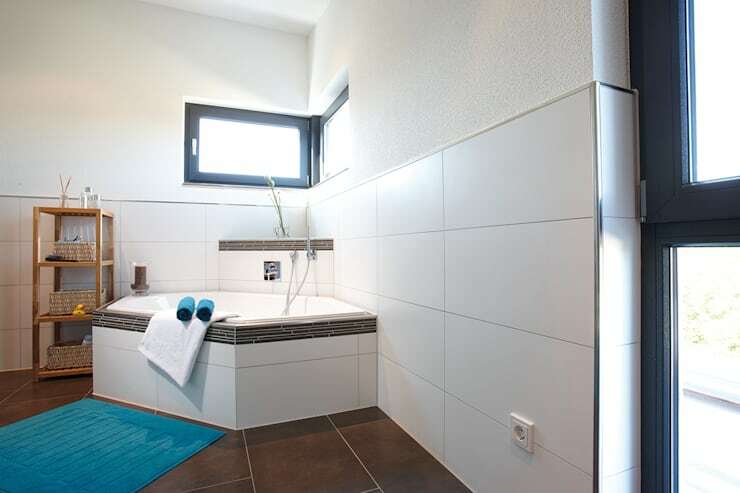 A blue bath mat and towels add colour to this bright and refreshing space. The presence of large and tall glass windows on the backside of the house indicates the owner’s love for openness and glorious natural views. 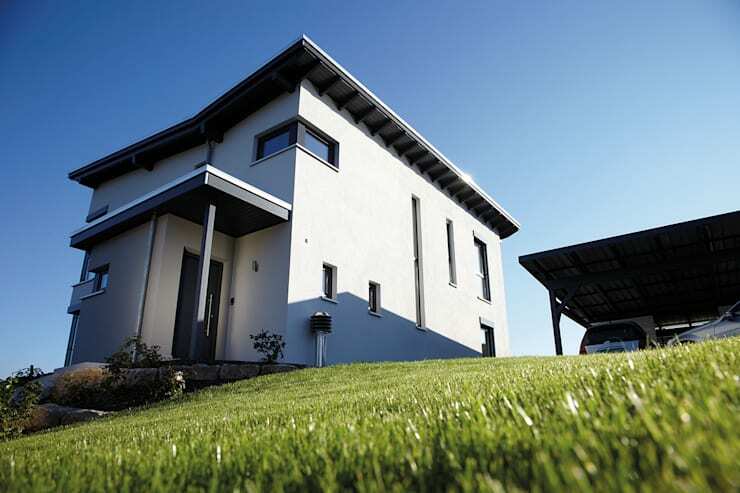 The slope of the land and the lush vegetation add to the charm of the backyard.